Now Karma Deck is the #1 Bestseller Stack on Lybrary. Karma Deck owners can also get Karma Deck Pro for a special price. Karma Deck is now expanded to six unique variations and included is a novel method of using CHaSeD in a random suit pattern. Deckcelence is available in combination with Karma Deck for half price. Amazers with Karma Deck is also available in combination with Karma Deck for half price. Rasik Deck is also available in combination with Karma Deck for a special price. The new "KARMA DECK" is something I find very intriguing! Without having to memorize a single thing, the author has come up with a clever idea that will allow you to know the position in the deck of any card named or to know the name of a card at any position in the deck! As you read on you will see there is a stack, but there is absolutely zero memory involved in working it! "You have developed a totally new approach to a Memorised Deck System. The method can certainly be learnt in a short time, and will appeal to many who find the traditional methods difficult to master. Highly recommended." - Graham Jolley. 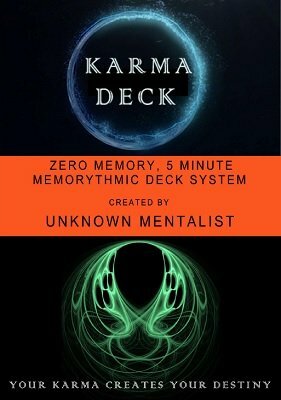 Karma Deck is a zero memory, 5 minute memorythmic deck system. This is based on a very clever and innovative principle which is not known to have been used before. This is the optimal combination of a stacked deck, a memorized deck and an algorithmic deck. With minimal effort, even a beginner can master this in no time at all. Almost all the effects existing for a stacked, memorized or algorithmic decks can be performed with this, and far more easily. Karma Deck is a game changer. 100% intuitive with zero memory work. If a 12 year old can learn Karma Deck in just 6 minutes, you can definitely learn in 5. Karma Deck can be used as a stacked deck, memorized deck or an algorithmic deck. Given a position you can know the card. Given a card you can know its position. Given a card you can know what card is before it as well as after it. Also, how many cards are above it and below it in the deck. With Karma Deck, if you cut the deck you can know how many cards are in each pile. And also what cards are in each pile. If you distribute Karma Deck to 52 people you can know who has what card for everybody. Karma Deck works with any suit order of your choice like CHaSeD, SHoCkeD, DuCHeS etc etc. Karma Deck system allows you to do amazing routines even without a deck of cards. Almost all existing routines of any stacked or memorized or algorithmic decks can be done with Karma Deck. And much more easily. 1st edition 2015, 4th edition 41 pages. what should i say about his one, already many people have reviewed it. I am the guy who hardly write any reviews, but this ebook forced me to write a few things because its an excellent and well worth book to have in your collection. the simplicity kills!. truly you will be amazed to memories the deck in less the 5 minutes. this book promises what it says. I would highly recommend this. If there is an Oscar Award for stack magic, I would give it to the Karma Deck without a second thought. The Karma Deck principle has redrawn the very foundations of stack magic as it has been structured so far. The history of stack magic will have 2 clear divisions now. Before Karma Deck and After Karma Deck. For me personally, this has entirely changed my thinking on stack magic and infact removed so many blocks. Calling this simply brilliant will be a gross understatement. Together with Karma Deck Pro and Kommando Kard, I have enough stack magic ammunition for the next decade, at least. I cannot recommend it enough. Have been actually using the Karma Deck for over 6 months now. Well, the basic idea of Karma Deck is pure genius, of course. On the top of that, it is so versatile. The main principle can give you 6 different stacks. And then it's solid power. I discovered in Amazers with Karma Deck. Many hidden patterns, which are totally invisible to the audience eyes. Yet, so flexible. Multiple suit systems can be combined with the stack seamlessly. The stage routine Deckcelence with the Karma Deck is a sheer delight to perform. A reputation maker. Even when I did not use the stack for over 3 weeks, it was UNFORGETTABLE. After using 8 Kings and Si Stebbins for over 15 years, I can say that Karma Deck is the best stack that happened to me, which will stay with me. Right now my excitement is sort of overflowing. The author shared with me a mega routine with Karma Deck which uses over 200 different playing cards. I got a chance to perform this recently at my college annual day celebrations (I teach undergrads). And what a devastating impact it created !!! Thank you, U n Me, for giving the Karma Deck to the community. For me, Karma Deck is 'THE' benchmark of stack magic in the past half century, at least. Way back in early 2014, I got Karma Deck from the author as part of a mutual barter we both had of some of our unpublished works. And since then received quite a few updates. Now when I look back at the Karma Deck, this has grown into such a phenomenal stack. Probably the most practical of all stacks out there. I would even venture to say this. If an absolute beginner in magic wants to learn his first trick, I would simply recommend him to pick up just the Karma Deck (& related routines, of course) and nothing else would be needed to entertain audiences professionally for more than an hour. For once, I think, we have a gem of an invention which actually lives up to its tagline "your karma creates your destiny". A valuable life time investment, IMHO. I am using Karma deck. The System is extremely Practical. I love the idea.. very easy.. very nice..I am glad that I learned the system. There are several systems exists, some are very popular and some other is not. Only because of individual ability to adapt the theory and implementing it perfectly. So no comparisons needed. The Interesting thing about "Karma Deck System" is, it maintains K.I.S.S (Keep It Simple & Short) principle while understanding the basics, once you master in it, then you can entertain anyone as you are like a Full Time Entertainer in Vegas Club. so Karma deck is just acting as a Catalyst to build your own act and Professional Shows. Extremely Easy and flawless system. Easy to Understand and even much easier to perform the same integrating in some mind boggling effects. Glad to know about it.. Superb!!!! 'KARMA DECK' a simple but one of the most impressive and workable memorized deck methodology, I have come across. A fantastic discovery, clever and innovative method to memorize full deck, allowing a performer to perform with ZERO stress. An amazingly easy system to create a memorized deck that allows quick retrieval of what card is at a specified position, or at what position a specified card lies. There is almost nothing to remember. I found this perfect for some effects that required a memorized deck, but were not possible with other memorized decks. The Karma Deck is worth every paisa. I had been using other memorized decks all these days, but after getting the Karma Deck, instantly switched to this one, as I feel it hardly strains the brain. It is not that we have to look at the gimmick each time we perform; it is just to master the method/system in a short span of time. A very clever idea from a dear friend of mine. Hats off to you for such a wonderful innovative idea. I just purchased the Karma Deck PDF and I am absolutely excited to learn the methodology of the Memorized Deck. It is indeed a very clever and genius invention in bringing about a very easy way to memorize a full deck. The best part is that the gimmick is more a mental image rather than a physical object! Hats off to this brilliant invention of which I had no clue of before! No wonders Richard Osterlind has given it a thumbs up endorsement. A fantastic discovery for a stacked deck. For a person who loves stacked deck like me, its a boon. And I also hadn't come across this type of stack earlier. I am sure i can perform my ACAAN without any memory work hereafter. Hats off to u. Interesting but I can't see the plus, compared to Si Stebbins for instance. It has the same drawbacks as S.S, and it is very easy with S.S to do the same things, without having to look at a "gimmick" that some (like me) don't even carry with them nowadays. And if you have to look at a gimmick, why not look at a crib sheet?! Plus the fact that it will look weird to look at it everytime you want to know the position of a card, while with S.S, it can be done as fast and in your head. Unless there were some examples of effects that you could do with this system, and not with other ones, I will stick to Si Stebbins.